1) In the UK, one of the leading $$meter companies is up for sale. There has been a lot of discussion about safety and security which has led to a long delay in the start of the program. 2) In Seattle, there was a hot debate before Council about the $$meter program. 3) A member is advising that BC Hydro is asking about a rate structure that affects those without access to gas. Notices have been circulated in many small communities. “In 1970, he said, it had climbed to one in 2,500; in 2000, one in 150, in 2004, one in 125, in 2008, one in 88, and in 2013, one in 50 and one in 27 in populated cities. Quoted are statistics compiled by the Australian ADHD Foundation. 5) The Ontario Government has put out an excellent video “ad” about the dangers of “distracted driving”. Cell phones can harm in many ways. We need similar short, startling ads about $$meters and Wi-Fi in schools. 7) Below is a long stream of emails from and to the BC Ferries re. Wi-Fi. And Segment #10 of my responses to the BCUC draft regarding my complaint about $$meters being fire hazards. In this section, BCUC acknowledges that the meter bases are designed for the analogs, but tries to assure that the bases and $$smart meters are compatible. How can this be if CSA has never certified them together, as it did with the analog meter? Please consider adding your voice to that of this member about the Wi-Fi on ferries. There is no choice for sensitive people who live on Vancouver Island. We would appreciate if BC Ferries would take concrete actions in protecting passengers from microwave radiation on board, instead of bestowing empty platitudes upon us and other passengers with electro-hypersensitivity (EHS), who also complained about this serious issue to BC Ferries before us. It is obvious, BC Ferries is not taking their own words seriously, otherwise they would have researched the long term health effects of WiFi (like the International Firemen’s Association has done), before un-tested WiFi radiation was unwittingly unleashed on passengers and crew for extended periods of time. Human, animal, and plant life is controlled by naturally occurring electromagnetic fields and signals. With their extremely low to very high frequencies, technical electromagnetic fields can interfere strongly with cell communication and metabolism. Initially, the body’s natural healing capacity, in its attempt to maintain homeostasis, will correct imbalances through finely tuned control mechanisms. Prolonged electromagnetic stress, however, may lead to a chronic impairment of this important homeostatic response and result in disease. Health care professionals worldwide make observations that are consistent with and increasingly confirmed by scientific findings. Adverse effects of electromagnetic fields and the fundamental impairment of biological control mechanisms can occur well below current exposure limits and have been demonstrated, in some instances for decades. The international BioInitiative Working Group (2007) documented a broad range of health risks based on more than 1500 scientific studies. Identify and clearly mark protected zones for electrohypersensitive people; establish public areas without wireless access or coverage, especially on public transport, similar to smoke-free areas for nonsmokers. It is disturbing, that BC Ferries is unaware, that radiation bounces like a ping pong ball inside metal rooms and intensifies. Are your vessels not made of steel? – Has BC Ferries consulted with an independent building biologist, before plunging passengers and crews into this uncontrolled biological experiment, without their consent? This Building Biologist, is a translator of many science research papers on RF radiation, such as WiFi, which makes her the most knowledgeable and qualified building biologist in BC. Dr. Karl Maret, engineer & physician, former researcher of the Canadian Forces, and expert in electromagnetic fields, such as WiFi. BC Ferries’ management can learn for themselves, the effects that WiFi radiation has on the human body, and how electro hypersensitivity is rapidly developing into a global health crisis. This (translated) warning poster of wireless technology is prominently displayed in Austrian medical clinics. In Canada, the general public, including most doctors, remain uninformed of the dangers that cell phone, cell towers and Wifi radiation poses for the human body, especially children, the elderly and those who suffer health issues. Most people, once having received scientific/ medical information on biological effects, especially for children, no longer feel the need for constant wireless connectivity, when they realize that the price to their health is far too high! Your suggestion for us to travel south to Swartz Bay is bizarre! We have to travel hundreds of kilometers, 5 to 6 hours by car, coming from the North Island. For the return trip, we have to drive another 5 to 6 hours, just to get back home. A massive time and fuel expense! To add insult to injury, BC Ferries would charge us for the State Rooms, (which we never needed before, prior to WiFi on board), twice! Why do we, the paying customers, have to accommodate BC Ferries? Fine customer service that is! This is the vessel where we were swept by the powerful radar beam on the outside car deck, non-stop, every 2-3 seconds! Our radiation e-smog meter indicated very high readings! Also several small children, playing on the deck, were swept by the vessel’s misaligned radar. Radar is for navigation purposes only, not for careless radar radiation exposure of the public! Why are there no provisions made for those who do not wish to expose their families to WiFi radiation, a known carcinogen? WiFi shares the same cancer classification as DDT! Why is BC Ferries unwilling to make allowances for passengers, who suffer from electro – hypersensitivity (EHS), formerly known as ‘microwave sickness’? Let’s be clear about this: EHS is not an illness, but a man-made affliction! a. We ask that this important issue is brought before management. b. We ask that management reviews the information we provided in text, as well as view the informative video we provided. c. We ask that allowances are made for passengers who do not wish to be irradiated by WiFi, by providing at least one e-smog pollution – free area on board of all vessels. If this information is not sufficient, we can forward more scientific research to management, as well as provide contact information to EMF scientists. We can also introduce several Vancouver Islanders to management, who also suffer from this hideous man-made affliction, called EHS. It is negligent towards passengers and crew, if BC Ferries management does nothing, and refuses to educate themselves and staff on this important health issue. Thank you for taking the time to write to BC Ferries and for sharing your concerns about Electromagnetic Hypersensitivity. I notice I do not have a telephone number to reach you, so I wanted to touch base by email to acknowledge receipt of your feedback. I regret to hear that in June when you travelled, your vehicle was loaded onto a ramp that had a steep angle, and you advised us that the placement of your vehicle onboard affected your wife’s travel in a negative way as she found even greater EHS sensitivity in the area you were parked. I am sorry to hear this. I can appreciate your viewpoint that you would like to see BC Ferries take measures to reduce or eliminate equipment that is believed to contribute to health concerns of individuals with EHS. I assure you that all matters of safety are carefully considered at BC Ferries. It is our top priority to provide safe travel for all of our customers. As you may already know, BC Ferries’ vessels are equipped with radar which is required for navigational purposes. Further, Wi-Fi equipment has been installed on some of our vessels and terminals due to high demand from customers. For those traveling from the mainland to Vancouver Island we have one vessel, the Queen of Alberni, that does not have any Wi-Fi access points installed. The Queen of Alberni currently sails on the Tsawwassen – Duke Point (Nanaimo) route. Another option for those concerned about Wi-Fi is to contact BC Ferries for assistance exploring arrangements to make use of a stateroom on vessels that still have this additional space. While unfortunately none of the vessels on the Horseshoe Bay – Departure Bay route have staterooms, there are vessels operating on the Tsawwassen – Swartz Bay route that would provide this option. Once again, thank you for writing. Your concerns have been shared with the President and Executive team for their consideration. We do appreciate hearing from you and we are here to assist to the best of our ability to help make your travel on BC Ferries as positive and pleasant as possible. The meter socket that currently is on homes was certified by CSA in conjunction with the analog meter. Never has it been certified to hold anything besides the analog, and certainly not a digital meter. There has been no independent certification of these meters except by Measurements Canada to ensure accuracy. Safety Regulation requires approved certification marks for non-utility electrical products such as meter sockets. A CSA mark on the product ensures that the Certification Body has confirmed that the product meets the CSA standards applicable to that product for the intended service. Comment: At this point it is critical to point out that the CSA Standard governing meter bases specifically prohibits its use as a load-current interrupting device. 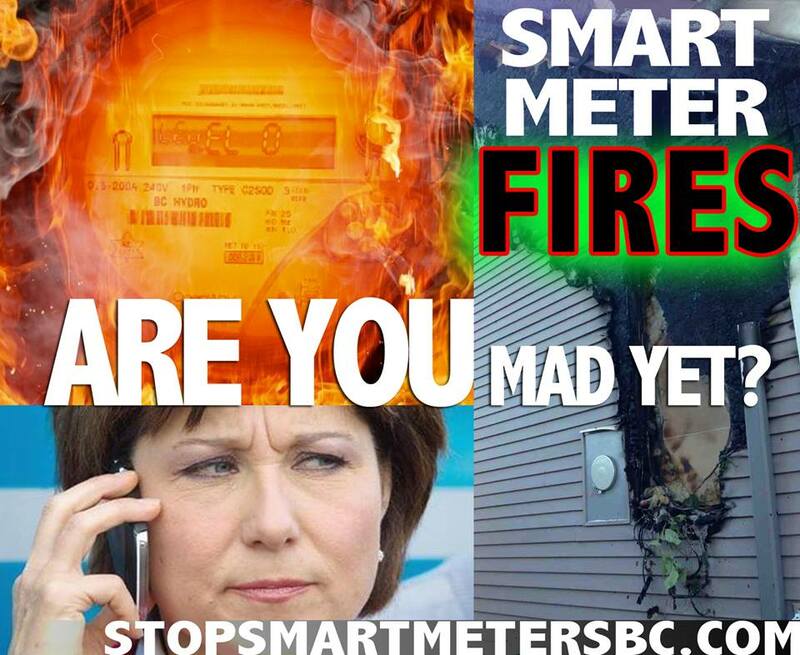 BC Hydro was advised by Registered letter dated 7 May 2014 that using the meter and base to interrupt load current (“Homeowners do not need to be home when a meter is changed out”) violated the CSA Certification of the homeowners’ base and causes arcing erosion of the contact stabs. This warning was ignored and BC hydro continues the practice. This practice by the Utilities needs to be critically examined by the BCUC and appropriate action must be taken. CSA C22.2 115-14, section 5.12 addresses compatibility with the meter. To provide compatibility with meters complying with CSA CAN3-C17, the dimensions of the meter socket rings, the envelope of surfaces, and the position of the meter jaws with respect to the central axis of the meter socket and to each other shall comply with Figures 4 to 12 inclusive of this Standard. The meter envelope is derived from figures registered in CSA CAN3-C17. It is clear that the CSA standards (C22.2 115 and CAN3 -C17) reference each other for the purpose of ensuring physical compatibility. This integration of compatibility into the standard ensures that issues of physical compatibility are being considered by both standard making bodies which would include compatibility of new to older versions. So although the statement that the older meter sockets were not designed (specifically) for new meters may ring true, the fact is that meters and meter sockets installed in BC are designed to a common standard that considers the compatibility of the meter to the meter socket and vice versa. The ITRON Openway meter used in BC is the very same meter that failed and burned “by the palette” in Texas according to legal testimony. It is logical to assume the same “common standards” were used there as in British Columbia. It seems, therefore, that the standards that are being used are inadequate for these meters. Comment: Note that it is the responsibility of the Manufacturer and the Purchaser to ensure that the devices meet the physical and performance requirements of the Purchase Order, assuming that there are no Codes and Standards mandated by BC Law. This is usually accomplished by random testing, review of the Quality Control procedures and the Quality Assurance documentation and verification by the Purchaser’s Professional Engineer knowledgeable in that field. It also requires follow-up from reported incident cases of, for example hot-sockets so that improvements to practices can be accomplished. This does NOT appear to be the case with the smart meter implementation. In the absence of any Standards, the BCUC needs to be able to validate and to document the accuracy of the content and veracity of such Utility procedures, since it is presently not done. From correspondence with BC Hydro, it appears that any failed meters are returned to Itron and are not examined by BC Hydro or its Laboratory, leading to the assumption that any follow-up to improve Hydro Practices does not occur. In addition, it would appear that the Quality Control and Quality Assurance steps have been delegated to Itron and do not take place within the BC Hydro Organization, so third-party quality control and assurance has not been demonstrated.